Lum Tanto Natural G-10 HAP40/SUS - Spyderco, Inc. 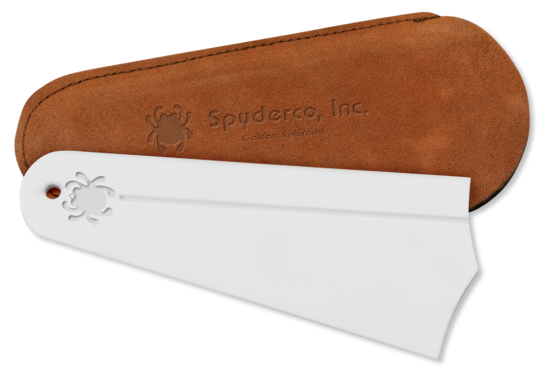 Page 1167 – Spyderco, Inc. Specially manufactured for Blade HQ, this one-of-a-kind expression of Spyderco’s classic Lum Tanto Folder features a high-performance HAP40/SUS420 laminate blade steel and natural G-10 handle scales. It is available exclusively from Blade HQ. Designed by the late Bob Lum, this remarkable knife has long been a Spyderco cult favorite. It showcases Lum’s incredible talent for adapting classic Asian blade patterns to modern custom and production knives and is one of the few tanto-style blades ever offered in the Spyderco line. This remarkable Exclusive version of it not only resurrects Lum's groundbreaking design, but supercharges it with a laminated blade featuring a high-performance HAP40 tool steel core couched between layers of SUS420 (also known as 420J2) stainless steel. Containing generous amounts of tungsten, molybdenum, vanadium, and cobalt, HAP40 possesses exceptional toughness and high abrasion resistance—key qualities of a superior blade steel. When flanked by layers of SUS420 stainless steel, the transition between the core and the blade's outer layers is clearly visible just above the cutting edge. Not to be outdone, the distinctive handle of this knife features textured natural G-10 scales. The near-translucent quality of this material highlights the handle's skeletonized stainless steel liners and sturdy LinerLock mechanism while providing a secure, non-slip grip. To ensure ease of carry and keep the knife poised for instant access, the handle includes a polished stainless steel pocket clip configured for right-side tip-up carry. A truly unique expression of one of Spyderco’s most dynamic designs, this knife is destined to become an instant classic.